For over half a century neutron scattering has added valuable information about the structure of materials. Unlike X-rays that have quickly become a standard laboratory technique and are available to all modern researchers in physics, chemistry, materials and earth sciences, neutrons have been elusive and reserved for specialists. A primary reason is that neutron beams, at least so far, are only produced at large dedicated facilities with nuclear reactors and accelerators and access to those has been limited. Yet there are a substantial number of experiments that use neutron scattering. While earth science users are still a small minority, neutron scattering has nevertheless contributed valuable information on geological materials for well over half a century. Important applications have been in crystallography (e.g. atomic positions of hydrogen and Al-Si ordering in feldspars and zeolites, Mn-Fe-Ti distribution in oxides), magnetic structures, mineral physics at non-ambient conditions and investigations of anisotropy and residual strain in structural geology and rock mechanics. Applications range from structure determinations of large single crystals, to powder refinements and short-range order determination in amorphous materials. Zeolites, feldspars, magnetite, carbonates, ice, clathrates are just some of the minerals where knowledge has greatly been augmented by neutron scattering experiments. Yet relatively few researchers in earth sciences are taking advantage of the unique opportunities provided by modern neutron facilities. The goal of this volume, and the associated short course by the Mineralogical Society of America held December 7-9 in Emeryville/Berkeley CA, is to attract new users to this field and introduce them to the wide range of applications. 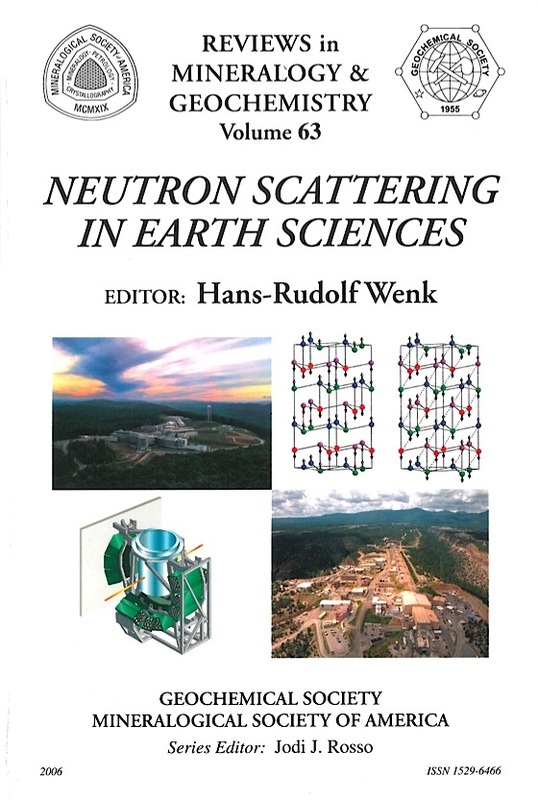 As the following chapters will illustrate, neutron scattering offers unique opportunities to quantify properties of earth materials and processes. 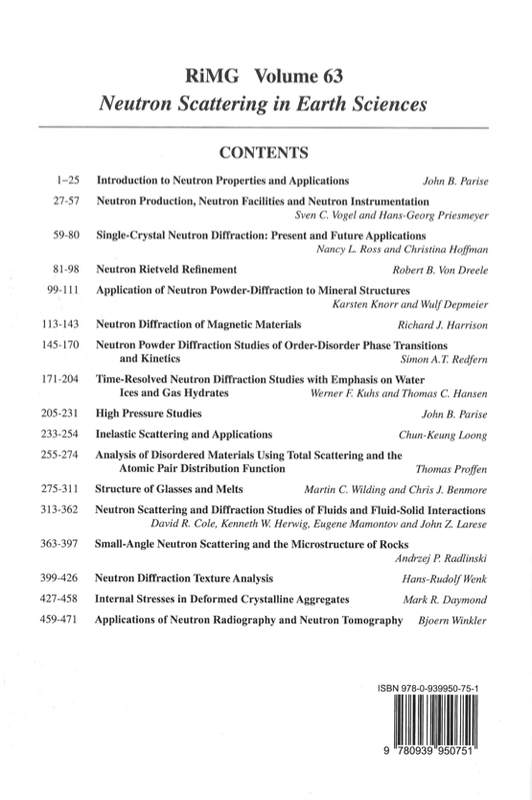 Focus of this volume is on scientific applications but issues of instrumental availabilities and methods of data processing are also covered to help scientists from such diverse fields as crystallography, mineral physics, geochemistry, rock mechanics, materials science, biomineralogy become familiar with neutron scattering. A few years ago European mineralogists spearheaded a similar initiative that resulted in a special issue of the European Journal of Mineralogy (Volume 14, 2002). Since then the field has much advanced and a review volume that is widely available is highly desirable. At present there is really no easy access for earth scientists to this field and a more focused treatise can complement Bacon's (1955) book, now in its third edition, which is still a classic. The purpose of this volume is to provide an introduction for those not yet familiar with neutrons by describing basic features of neutrons and their interaction with matter as well illustrating important applications. The volume is divided into 17 Chapters. The first two chapters introduce properties of neutrons and neutron facilities, setting the stage for applications. Some applications rely on single crystals (Chapter 3) but mostly powders (Chapters 4-5) and bulk polycrystals (Chapters 15-16) are analyzed, at ambient conditions as well as low and high temperature and high pressure (Chapters 7-9). Characterization of magnetic structures remains a core application of neutron scattering (Chapter 6). The analysis of neutron data is not trivial and crystallographic methods have been modified to take account of the complexities, such as the Rietveld technique (Chapter 4) and the pair distribution function (Chapter 11). Information is not only obtained about solids but about liquids, melts and aqueous solutions as well (Chapters 11-13). In fact this field, approached with inelastic scattering (Chapter 10) and small angle scattering (Chapter 13) is opening unprecedented opportunities for earth sciences. Small angle scattering also contributes information about microstructures (Chapter 14). Neutron diffraction has become a favorite method to quantify residual stresses in deformed materials (Chapter 16) as well as preferred orientation patterns (Chapter 15). The volume concludes with a short introduction into neutron tomography and radiography that may well emerge as a principal application of neutron scattering in the future (Chapter 17). Special Presentation: Diffusion Studied by Quasi-elastic Neutron Scattering and Microscopic Simulation: Water in Clays.